Looks like its going to be a wonderful day! @Christina Beadzoid: I've been scarily organised. Not like me at all! My head is ready to explode! 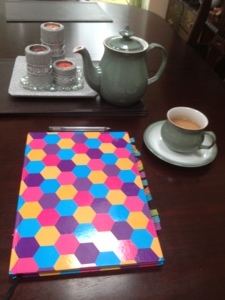 Candles, tea from a pot and stationery - what could be better. @Midlife Singlemum: A glass of wine? And believe me when this work is being done at night, or I'm reviewing my plans and routines within it, then wine is essential! Such a calm, restful and organised reflection of your day/s. My house would drive you nuts.. junk scattered everywhere! Hope the rest of the day remained as calm and silent!! @Clive: Yes, the rest of that day did! @BavarianSojourn: Thanks. It belies the reality. Another apt title for this photo would be: 'The Calm Between the Storms'!! @Looking for Blue Sky: Got it in one ;-)Well done! This is my 'Book of Dance Steps' completed over the past 8 weeks. Almost there, the blocking of routines has been done (mostly!) But not too much relaxing as we concentrate on putting it altogether and polish their performances. Can kind of relax after opening night!